I’m going to be honest- it’s been long enough since the previous beta that I can’t tell what’s changed. It doesn’t help that I’m only doing the new content- leaving the Dancer and Knight for the full game. The game still looks fantastic, presenting 2D sprites in a 3D environment brought to life by dynamic lighting. I’ve been playing exclusively in handheld mode (I left my dock in another country), and it fits better than more detailed games. I’d still appreciate the pixels more on the big screen, but the fact that I can play at all during my travels is a huge bonus. Unlike the previous beta, where we got to play through two story lines and were limited simply by their length, the current demo (which is available to download now via the Nintendo eShop) has a time restriction. You have three hours. That’s three hours that’ll carry over to the main game when it comes out (on July 13). My friends have been more or less min-maxing their playtime, starting files to see cutscenes on different accounts so that when they play under their main Nintendo Account, they can skip the cutscenes altogether. I’m not quite that dedicated. I started with the scholar, Professor Albright. He’s your basic mage in terms of combative abilities- his regular attack is pitiful, but if you have the MP, his damage is quite respectable (and hits all targets). You’ll need that MP too, because without it, even opening enemies will be your downfall. I found myself reliant on items and calculating battles in advance the experience points I would need to level up (thus restoring health and magic points). 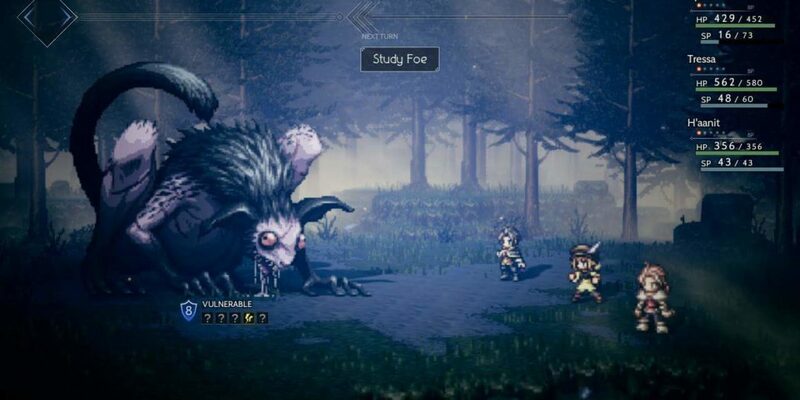 The first boss (which I admit I lost to twice) required I learn and practice the intricacies of Octopath Traveler’s combat in ways most RPGs do not (at least not in the opening hour). 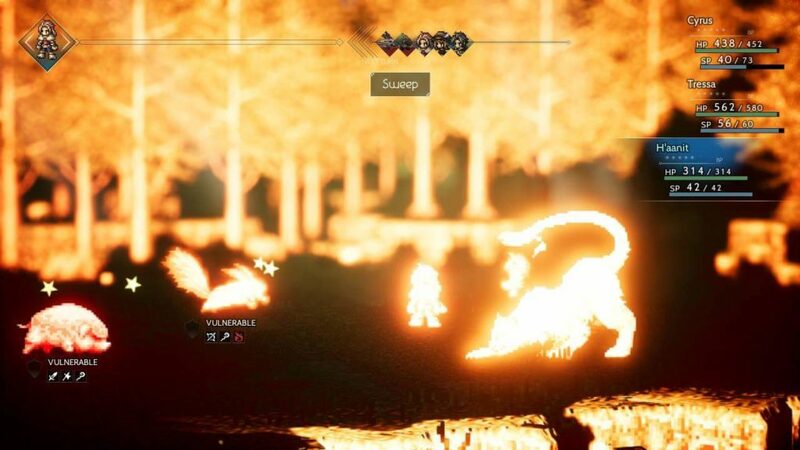 Compare this to starting with the knight, Olberic, from the prior beta, when I never saw a game over (and certainly not against wild bats), barely thought further ahead in battle than the next burst, and certainly didn’t have to learn more than the basic ropes. I did eventually get through Albright’s opening, excited for a new character who wasn’t as reliant on MP to survive. 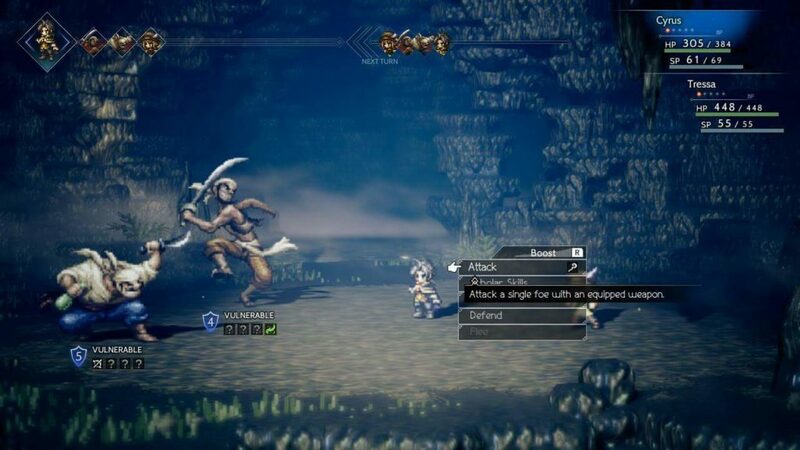 In Octopath Traveler, players can recruit the eight main characters, and start with any of them. 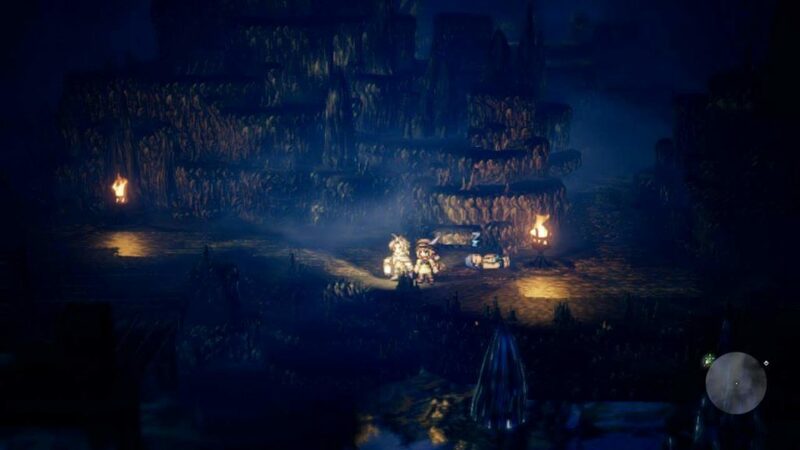 Recruiting means finding them in their home town, playing through their opening (with any other characters you’ve recruited along for the ride) (each area scales to keep up with your new items and larger party), and finishing their first chapter before welcoming them into your team. 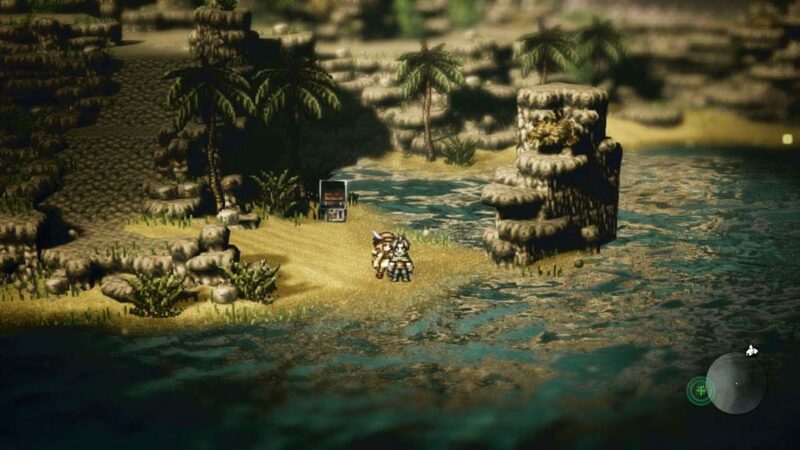 By coincidence, I found myself headed for Tressa, the merchant, if by coincidence I mean I was short of funds and desperate for better defensive equipment. Her ability to randomly pick up money sounded particularly useful. Only more so, she was capable of dealing significantly more damage with her spear and bow than Albright ever could with his staff. I managed to complete her story right at the end of my second hour, keeping her along for the ride as I raced to find number three. The developers of Bravely Default have done a much better job in this game in presenting interesting characters. I found myself almost instantly attracted to Albright’s sharp and inquisitive mind, and Tressa’s thirst for adventure. More so, I already have strong, negative feelings about a shifty seeming headmaster who forced Albright on sabbatical, and am interested to see how a pirate-turned-merchant plays into Tressa’s story going forward. Considering I had wanted to skip every conversation the Bravely Default cast held (and could) (but didn’t), this was a welcome surprise. I also hope that the cast comes to interact with each other more than they do in their opening chapters, where they don’t at all. It remains to be seen, though, if Octopath Traveler’s combat and leveling systems can keep me as enthralled as Bravely Default. While I never completed Bravely Default’s campaign (partly due to repetition, and partly due to not caring about the story), I did hit the level cap and grind each character’s jobs to the max for the sheer fun of it. 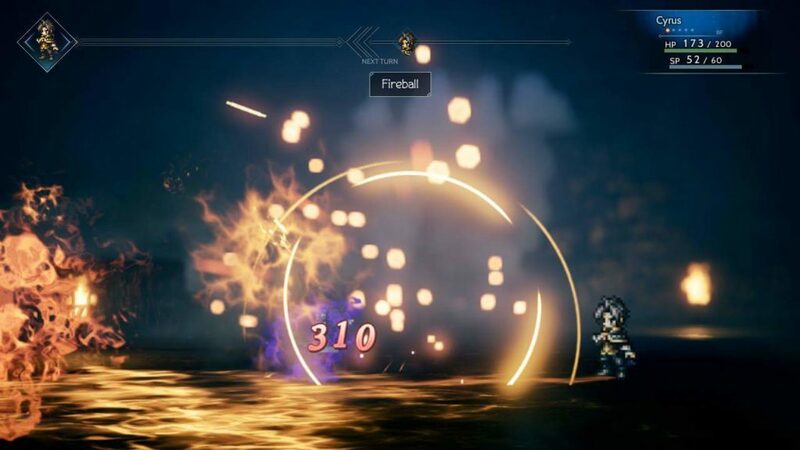 Octopath Traveler’s boost mechanic is not disimilar on the surface to Bravely Default’s brave or default mechanic. You save up turns in order to spend them all at once for big damage. Here, that starts with using an enemy’s weakness in order to “break” them, canceling their upcoming turn and causing them to take significantly more damage. It becomes a balance. Do you spend all your boost in order to prevent them from unleashing a devastating attack? Or do you save your boost for after the break, allowing you to deal heavy damage? It’s a fun quandary, one made more enjoyable by more party members and differing enemy encounters. So far, I’m only more excited to play Octopath Traveler. My biggest concern (the story) seems to have been misplaced, and the new characters are fun to play with. You can start your three hour Octopath Traveler demo right now, by downloading it from your Nintendo Switch’s eShop. 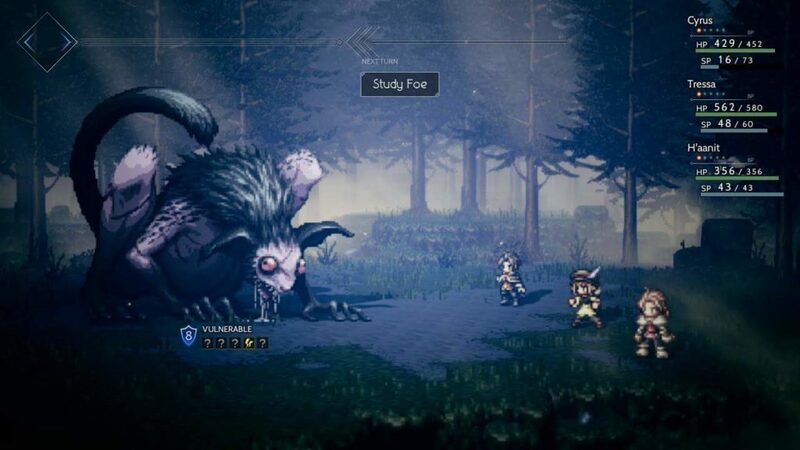 All progress you make will carry over when Octopath Traveler launches on July 13, 2018. My only recommendation is that you don’t start with Albright, who, for all his detective charm, struggles on his lonesome.